On June 27, a team of researchers, organized under the “Discover Qinghai” program arrived at Zhuonai Lake, in the depopulated Hoh Xil Nature Reserve, Xinhua News Agency reported. The lake-district is at an altitude of 5,000 meters above sea level and is a lambing site for Tibetan antelopes. The "Discover <?xml:namespace prefix = st1 ns = "urn:schemas-microsoft-com:office:smarttags" />Qinghai" program is a series of activities and events to introduce Qinghai. Part of the program includes one involving the antelope and aimed at promoting the protection of the animals and their living environment. Indirectly, it is hoped that the publicity generated from the program will aid the animal's selection as the mascot for the 2008 Beijing Olympics. 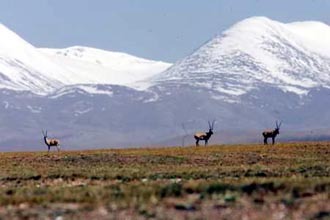 Su Jianping, a researcher with the Northwest Plateau Institute of Biology of the Chinese Academy of Sciences, said the lambing period of Tibetan antelopes in Hoh Xil is from the end of June to the middle of July each year. Many antelopes have already made their way to the lake-district. 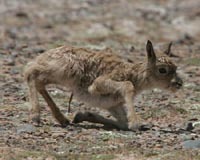 Xinhua journalists saw some female antelopes taking their newborns to forage for food in the hillsides. Ever alert, the mothers gently guided their young out of harm's way when they saw the team's vehicles two to three kilometers away. Researchers hope to gain a better understanding of the antelope in terms of its population numbers, lambing patterns and distribution. The team hopes to complete its studies by July 3, with a first batch of data on population numbers to be worked out by mid-July.